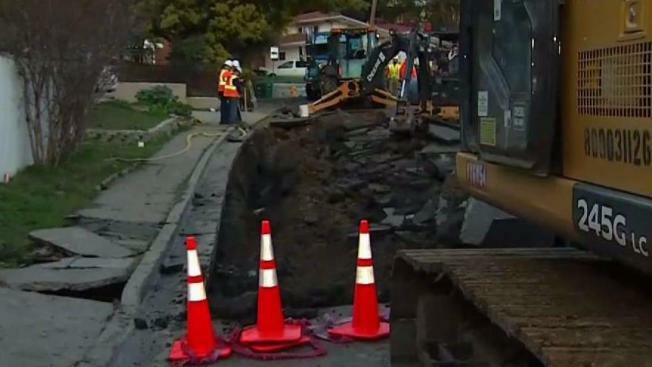 A water main break triggered a sinkhole and caused a stream of mud and other debris to flow down a street in Hayward Sunday morning, according to a fire official. The water main break occurred along Highland Boulevard near Margaret Drive, according to Hayward Fire Department Battalion Chief Chris Fitzgerald. Footage from the scene captured dirt, rocks and mud strewn across Highland Boulevard. A portion of crumpled pavement could also be seen where the water pipe burst. Some homes were threatened by potential flooding, but none of them suffered major damage, according to Fitzgerald. Residents in the area have been left without water service while crews work to fix the busted pipe, Fitzgerald said. Fitzgerald estimated that Highland Boulevard will not reopen until 9 p.m. at the earliest. He also estimated that water service wouldn't resume until roughly the same time. "Right now, the biggest obstacle we have is removing the debris from the broken asphalt and exposing the gas line that's underground and finding the complete extent of the damage on the water main," Fitzgerald said. Crews from the water department and PG&E were at the scene performing assessments and repairs, he said.